Hurricane season is here. Don’t delay, have a pet evacuation plan in place BEFORE disaster strikes. Service animals that assist people with disabilities are the only animals allowed in Red Cross shelters. They cannot accept pets because of health and safety regulations and other considerations. It may be difficult, if not impossible, to find shelter for your animals in the midst of a disaster, so plan ahead. Do not wait until disaster strikes or is twirling offshore. Do your research NOW and make a plan. If you evacuate your home, DO NOT LEAVE YOUR PETS BEHIND! Pets cannot survive on their own. If by some remote chance they do, you probably won’t be able to find them when you return. The best option is to have a friend or relative outside the evacuation area to house you and your pets. If that is not possible, try finding a pet friendly motel or one that waives animal prohibitions during evacuations. Check out www.petswelcome.com or www.dogfriendly.com . Make plans NOW. You may not be home when the evacuation order comes; find out if a trusted neighbor would be willing to take your pets and meet you at a prearranged location. Make plans NOW. Pet-friendly evacuation sheltering can be planned and executed in a multitude of ways. In some communities, the human evacuation shelter is within the same room, facility, or campus as accommodations for pets. This allows the animals’ owners to have a large role in caring for the pet. In other communities, the human shelter and pet shelter may be in separate locations. In this case, evacuees are told where to take their pets, while they stay at a separate shelter for people. Take time NOW to prepare for your pet’s evacuation. 1. Make sure your pet wears a collar with an identification tag with two phone numbers, one being your cell phone number and the second a number that may be reached in case of an emergency. Also, your pet should wear its current rabies tag. 2. Microchip your pet. This will serve as a backup should your pet lose its collar and become separated from you. A microchip is a simple piece of technology that will go a long way to reunite you with your pet. About the size of a grain of rice, the chip is implanted under the pet’s skin between the shoulder blades. It takes less than a minute to inject, much like a shot. Each chip has a serial number. The owner registers the number with the chip manufacturer’s database to include the pet’s basic description and the owner’s contact information. Be sure to update your contact information with the number of someone out of area who may be reached if you and your pet become separated during an evacuation. Remember, if all the phone lines are down and your emergency contact is your next door neighbor who has also evacuated, it will make reuniting your pet with you that much more difficult. 3. 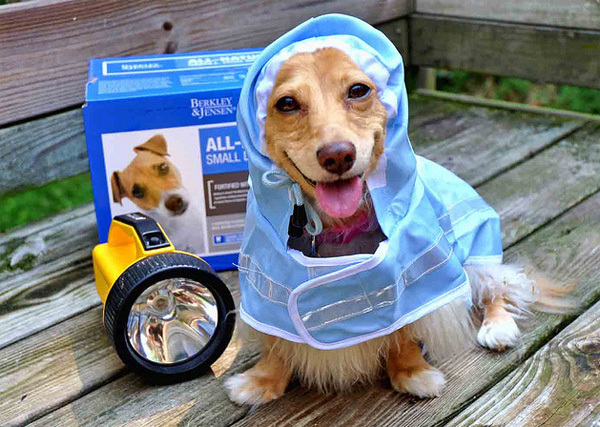 Prepare an evacuation kit for your pet. Get a backpack or small to medium size duffel bag and keep it packed. Contents should include a few favorite toys (avoid anything that squeaks or makes loud noise as a courtesy to others), a favorite blanket or towel to sleep on, bowls, flea and heartworm preventative, first aid kit, copies of medical records, current medications, and recent photo of your pet. 4. Plan to have enough food and water for each pet for one week minimum. 5. For dogs, include an extra leash along with their harness, leader, choke collar and/or muzzle. You must be able to maintain control of your dog during all travel and any subsequent time at a shelter. 6. For cats, include litter box and litter and also trash bags for refuse. 7. While many pets may enjoy riding in the car, many will become irritated at having to be confined to a car for hours on end. If you have any concerns about traveling with your pet, consult your veterinarian. Together, you can best plan for the safety and comfort of your pet. 8. Consider having a crate in your car to contain your pet throughout the evacuation travel. A pet may bolt when a door is opened, sending you and your family on a dangerous chase. Plan to have a crate or carrier for your pet to stay in when you reach your final destination. A hurricane evacuation is a hectic and stressful process for you and your pet. By making evacuation plans for your pet before a hurricane, you can save time when it counts the most.